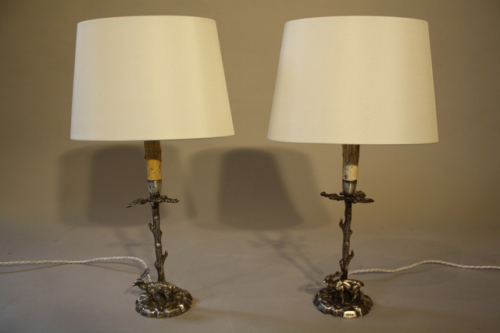 A good pair of Valenti silver metal table lamps depicting stylised Oak trees with stags standing on a rocky outcrop. Signed Valenti. Spanish c1950. Charming detail and a good size. 44cm height including cream oval shade. 24cm high without shade. Rewired and PAT tested for UK use.